Each year during the months of August and September, the Diocese of Juneau undertakes a major fundraising campaign, known as “Faith in Action,” for the support of our Church activities at the diocesan and parish levels. 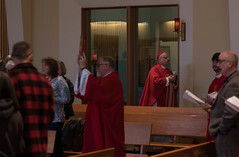 During this campaign, which is not coincidentally timed to anticipate the annual payment to Alaskans of the Permanent Fund Dividend, each Parish of our Diocese is asked to meet a certain financial goal over and above its normal weekly collections. Half of this goal, whether or not it’s actually collected, is paid to the Diocese to support a variety of ministries throughout Southeast Alaska. Any money that the Parish collects above one-half of its goal may be used for its own purposes, for example, for major repairs or unusual expenses. This year, the total goal for Faith in Action is $320,000, divided among the Parishes in accordance with their sizes and past levels of giving. Of this amount, $160,000, or half, is intended for the support of the Diocese as a whole; and the rest of the money collected during the campaign will remain with the Parishes that collected it. Because Faith in Action takes place as our parishioners are returning from their summer activities and travels, a number of us pastors take the opportunity, not only to promote Faith in Action, but also to invite our people to reassess the financial amounts that they contribute to the support of the Parish during the rest of the year, especially in the weekend “plate” collections that are the financial backbone of most Parishes. Generally, we offer an accounting of the Parish income and expenses for the preceding fiscal year, which usually demonstrates that the activities of the Parish have been significantly constrained by the limited income it receives from its members. I then tend to propose to the people that we make an attempt during the current year to reach a somewhat higher level of Parish income. In doing this, I sometimes show what a small fraction of our parishioners significantly contributes to the support of the Parish, and suggest that even a small increase in giving by most of our families would help us reach the desired income. I then explain what additional services we could provide as a Parish if that income level were attained, or what repairs or improvements it could support. This “Sermon on the Amount,” as I like to call it, can be an uncomfortable experience for priest and parishioners alike. After all, we are asking our people to adjust their financial priorities, an effort that can affect every aspect of their lives. Aside from those parishioners who already are in the habit of giving generously to the Parish, we are confronting the great majority of our people with this question: what can you give up in some other part of your life in order to give more to the Church? This can be a very hard question for those of our people who are on limited incomes (who, in many cases, are proportionately among the most generous! ), or who are raising families, with the myriad of expenses and sacrifices that effort entails. Even for those who are financially well off and do not have immediate family expenses, the question is not a pleasant one. Adding to this general discomfort about discussing money, which also exists in the secular world, is the attitude held by many of our people that soliciting and collecting money is something that is illegitimate in the context of the Church. Even we priests can be affected by this sense that there is something that is not right in “talking about money” as it is often disdainfully called. This attitude is often based on an assumption that the Church should devote its attention only to spiritual and private moral matters, and that participation by the Church in the material and economic realities of this world is beneath its dignity, unworthy of a people that calls itself the Body of Christ. And yet, it is precisely because we are the Body of Christ that financial support of the Church is an essential and holy aspect of our lives as Christians. When he came to Earth, the Son of God did not remain a disembodied Spirit, accomplishing our salvation in separation from material reality. He assumed a physical body, lived a life subject to all the material and economic limitations to which we all are subject, and continues his presence in a community, the Church, consisting of flesh and blood human beings living in, and called to transform, the material world. Our Church, imitating Christ himself, is sacramental: a material reality that also makes present spiritual realities. For the Church to exist, it must consist of both spirit and matter. The Holy Spirit of God works in a material structure consisting of physical human beings brought together in the ways that humans must be: through earthly communities that depend on the things of this world. The Gospel cannot be preached and celebrated without these communities, established on a stable basis, and all that this entails, including the financial resources necessary for their continued life and service to God and others. Even the most spiritual, heavenly elements of our life as a Church, such as the celebration of the Sacraments, are based on this material dimension of our existence. 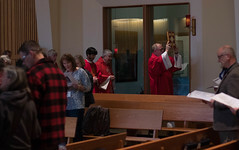 The Eucharist itself cannot be celebrated unless the community can provide bread, wine, a suitable physical space, and a properly prepared priest and assembly. These material realities, in the time and place of history in which we live, require money. Providing this money is an essential part of the vocation of every Christian to the extent that he or she can do this. Contributing to the material support of the Church is one of the six great precepts of Catholicism: right up there with attending Mass on Sundays and holy days of obligation, and fasting and abstaining on the appointed days. Indeed, it is no less sinful for a Catholic to willfully withhold financial support from the Church than it would be for him or her to deliberately and freely miss Mass on Sunday, or eat meat on a Friday during Lent. Many people confess the latter two sins in the Sacrament of Reconciliation. Very few confess that they have failed to support the Church financially in accordance with their ability. And this reflects our widespread, mistaken assumption that financial support of the Church is not a necessity, and that it might even be harmful and illegitimate. As we reflect on our support of the Church in the context of Faith in Action, I hope that we all can prayerfully recognize how essential this is for the work of salvation. Indeed, the deliberation and sacrifice that our giving entails have been proven to contribute greatly to the sanctification and spiritual growth of those who undertake it. Bishop Warfel used to say that our need to support the Church materially is at least as great as, if not greater, than the need of the Church for that support. It is an essential aspect of being a Catholic Christian. Unlike some contemporary popular preachers, the Catholic Church does not claim that those who support it generously will gain even greater material riches in return. It does assure us, however, that our growing generosity to the material needs of the Church will contribute to our continuing conversion—our transformation more and more into the likeness of Christ—and that it will help ensure the salvation of our brothers and sisters and the coming of his eternal Kingdom.